You know that faded daguerreotype of your great-great-grandfather Hiram – the stoic ancestor who lost a leg at the Battle of Gettysburg? It’s that family heirloom you keep squirreled away from prying eyes, lest someone notice the uniform is more gray than blue. Have you ever wondered what that picture might actually be worth? The best person to ask may be Ellicott City-based author and appraiser, Ross J. Kelbaugh. A collection of the complete plays of William Shakespeare, published in 1865 and valued at upwards of $225,000 today. A pristine photograph, and matching freedom papers, from a Maryland woman, who was born a slave in 1813 and gained her freedom at age 28. A silver creamer, handmade by Paul Revere, worth $80,000. MPT’s production staff is preparing to find more delectable treasures during its upcoming taping weekend, August 18 and 19, at Turf Valley Resort in Ellicott City. Kelbaugh told the Baltimore Post-Examiner he is looking forward to the happening, as he will again be front and center for all of the excitement and fun. “I was a guest on the first show and a client brought in a pretty rare item,” said Kelbaugh. “It was a freedom paper from Anne Arundel County that dated back to the 1830s. Maryland had the largest Free-Black population in the United States before 1860. With such a large population, they could be challenged at any time to prove that they were in fact free. So this was a pretty rare document, and I had been looking for one for a long time. I’d say it’s one of the rarest documents for early African-American history. 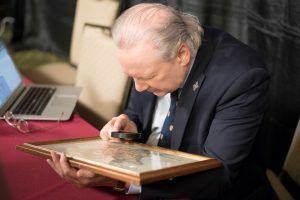 Kelbaugh said that ebay and The Antiques Roadshow have gone a long way in educating people about the true value of collectible items – making finds of any kind increasingly difficult. However, discoveries do still happen and often appear on Chesapeake Collectibles. We wondered how far people travel to get their objects evaluated on Chesapeake Collectibles? Kelbaugh talked about seeing the last baseball Cal Ripken signed before he officially retired, but he noted the oldest Oriole memorabilia he has seen was a pair of celluloid pins, which dated back to World Champion Oriole teams of the 1890s. “We also get a lot of Colt memorabilia, too. The greatest collectible of that kind I have seen was owned by Tom Matte. 19th Century Baltimore Oriole star “Wee” Willie Keeler. “Tom brought in his Super Bowl ring, but what I was really interested in seeing was that cuff he wore, when he played emergency quarterback, after John Unitas was hurt. I wanted to see how the plays were organized. He has two of them, but unfortunately, he didn’t bring either one in with him. One is in the NFL Hall of Fame – the other is in the Maryland Sports Legends Museum. But he did talk about them, though. “Tom said basically, it was arranged in columns, and each column had a formation. Then, under that formation, he had plays that he could call. He said his wife was a schoolteacher, and she had hand-lettered the paper to go into the sleeve he had strapped to his wrist. So he would kid her and say that she played football. Tom said that, once the other team realized what he was doing, they really tried to rip that cuff off of him. But I enjoyed getting a chance to talk with him. – Last signed photograph of General Patton, brought in by the daughter of a WWII general who was friends with Gen. Patton. Patton signed the photograph one day before a paralyzing car accident. The photo is believed to be the last one to be signed by General Patton before his death. – “The Thomas Jacob Archive:” The owner’s grandfather, Thomas Jacob, in 1939, at age 15, wrote to every professional baseball club and every living former player to commemorate the centennial of professional baseball. Kelbaugh said Thomas Jacobs was a stamp collector, so the blank autograph sheets he sent off were well marked and carefully organized. Signature sheets included one from each of the sixteen teams actively operating at the time; one of former Most Valuable Player awardees and one of Professional Baseball Hall of Famers. Every professional baseball club returned the sheets with signatures from then-current players. Kelbaugh said he is especially excited when people come in with objects to which they have a direct connection. The Apollo 11 lunar landing mission crew, pictured from left to right, Neil A. Armstrong, commander; Michael Collins, command module pilot; and Edwin E. Aldrin Jr., lunar module pilot. “One older fella – who was an engineer on the Apollo program in the 1960s – told me the story of how NASA discovered a telemetry problem a few days before a launch. He said that he and his team of computer programers worked around the clock to fix the problem. They got it done, and the mission went off without a hitch. He had photographs of his team, but he also had a thank you letter signed by Neil Armstong, Buzz Aldrin, and Michael Collins – thanking him and his team for their efforts in making the launch happen on time. His wife took me aside and said he was so proud that his team got that recognition. Everyone knows the three guys who made the flight, but there were thousands of people who made it possible. So it was neat for me to be able to put the spotlight on him. Taping for the new season will take place Sat. and Sun., Aug. 18 and 19, at Turf Valley Resort in Ellicott City. Registration is required by Mon. Aug. 13 to participate in the taping weekend. Anyone can have items assessed during taping weekend and may make an appearance on the show. Two registration options. Visit chesapeakecollectibles.com for more information and to register for a spot during taping weekend. ← Will Tennessee determine which party controls the Senate next year?